No matter how big an RV you get, if you live in it long enough, eventually you will begin to fill it up with stuff. This has happened to us and our 36′ fifth wheel trailer. When it was new and we first moved in years ago, it was so big that half our cabinets were empty. 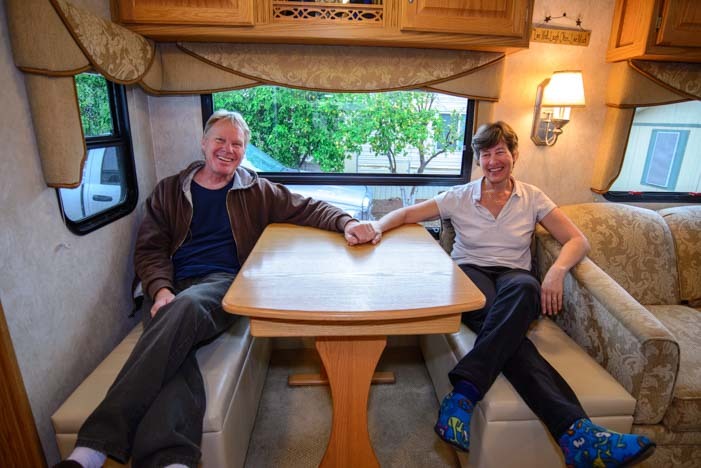 Since then, especially after consolidating back into our fifth wheel after living on our sailboat for nearly four years of cruising Mexico, our lives have changed a lot. We have found a new passion — photography — and all that camera gear has wound up taking over our living space. Our old dining area – no storage and seating for two. We began storing lenses in a drawer with dish towels (soft padding) and we had four camera bags that lived on our desk and under our dining room table. Camera bodies were always strewn across the sofa, fanny packs got piled on the desk, and tripods often got stuck on top of the subwoofer under our TV. Tucking everything away for safe passage while driving was a real pain. We needed to get this stuff organized! Mark had a brilliant idea one morning — replace our dining room chairs with big storage ottoman benches! 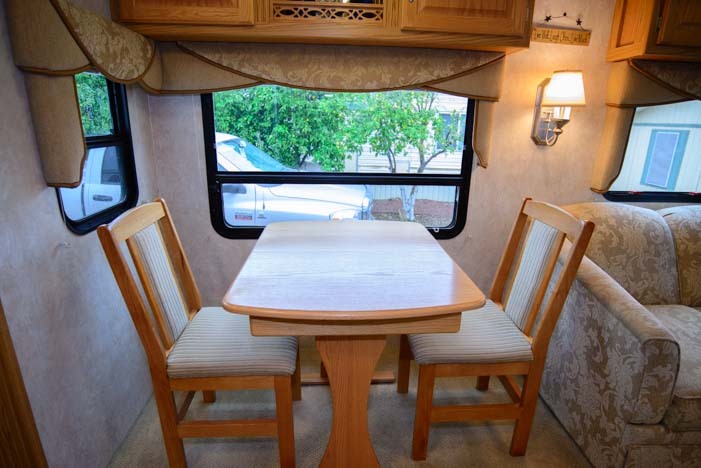 Our new dining area – lots of storage and seating for four. We began researching storage benches and ottomans and found the perfect thing from Simpli Home Furnishings. They are made of a nice faux leather, and there are no decorative buttons on the top, so the plush, padded top is very comfortable for sitting on (here’s more info). 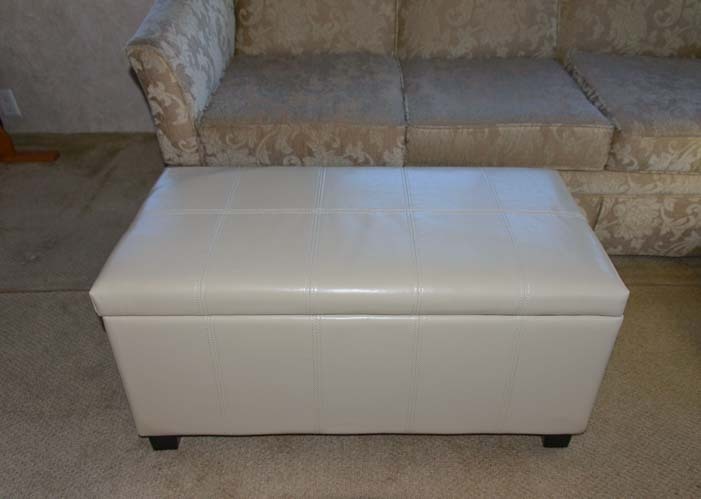 These storage ottomans are 36″ wide by 18″ tall and 18″ deep. The outside dimensions are 36′ long by 18″ high by 18″ deep. The inside dimensions are 33.25″ long by 11.5″ high by 15.5″ deep. 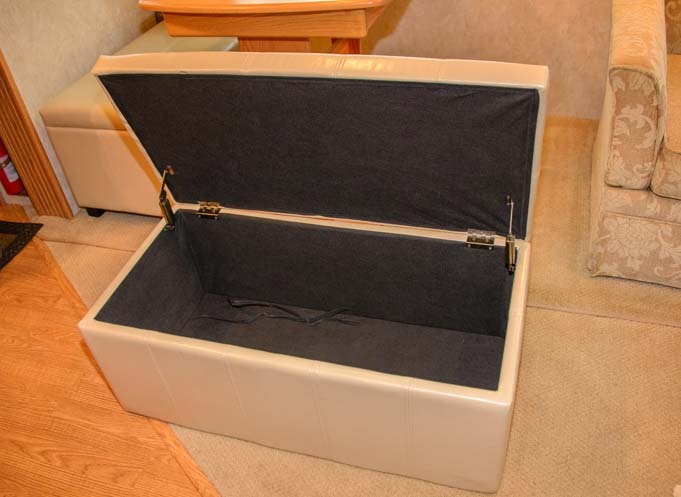 Our new storage ottomans have voluminous interior space. We bought them sight unseen from Amazon and couldn’t be happier. They come with four short legs, with three screws each, which were easy to attach. The only assembly is attaching the four legs. 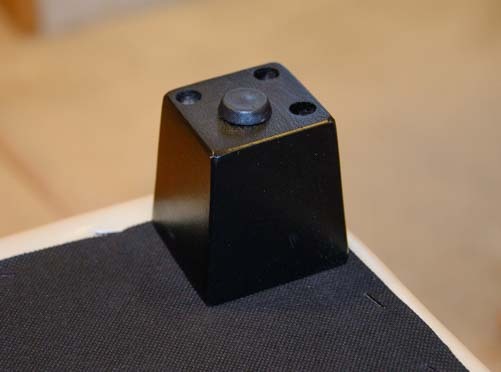 Some customers have complained that the screws are too long and coming up through the floor of the box, but the legs simply need to be oriented correctly with the three screw holes aligned with the outside edges of the ottoman. 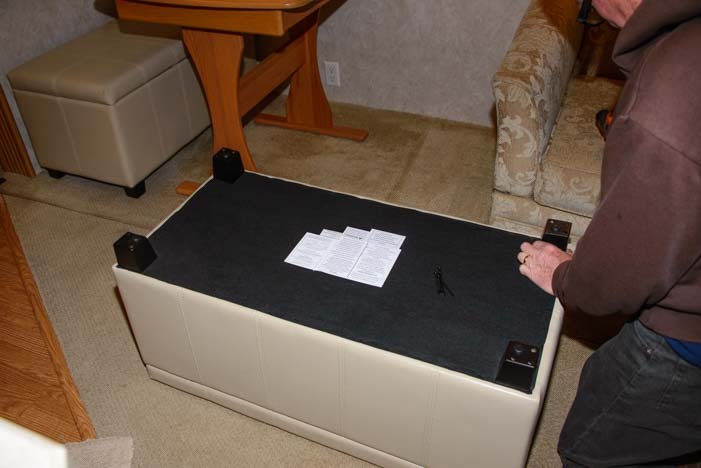 Be sure to align the screw holes with the outer edges of the ottoman. The legs were attached in just a few minutes using our cordless drill. 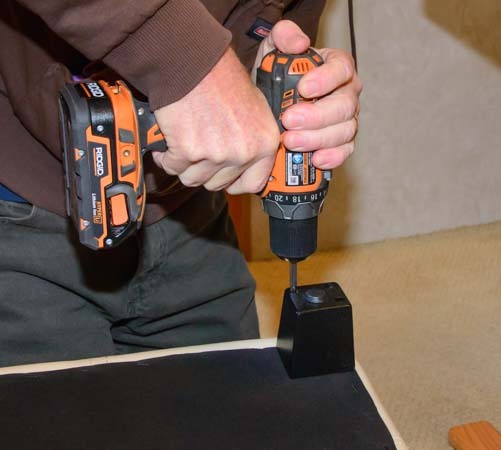 A cordless drill makes this a quick job! 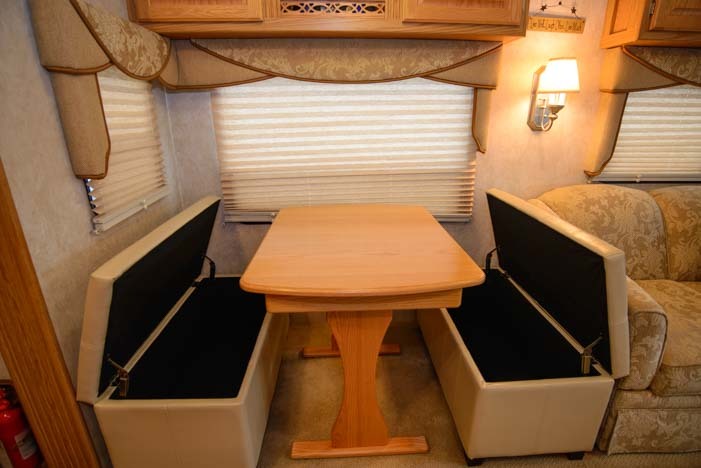 The end result is much more comfortable seating at our table and a whole bunch more storage space for our camera gear. 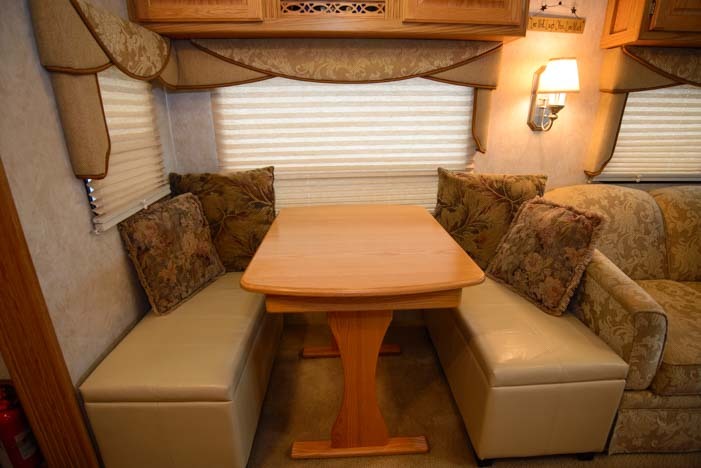 The tricky thing about storage space in an RV is that anything located behind the coach’s rear wheels is going to bounce around a whole lot as you drive down the road. That’s why most RVs don’t have the kitchen in the rear. Our new storage ottomans sit just slightly forward of the trailer’s axles. The box tops easily clear the table when they open. 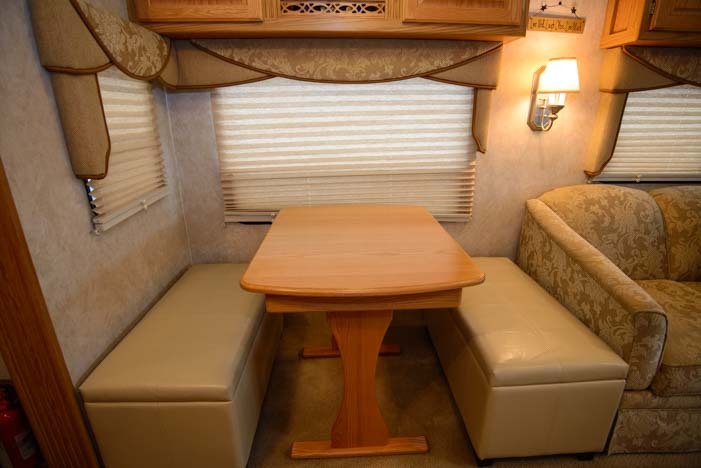 Another tricky thing with storage space in an RV is that in many coaches, like ours, the shelving is very flimsy. We prefer not to put anything heavy into the wall cabinets (except in the kitchen where our cabinets are more sturdily built). But it doesn’t take long to run out of storage space down near the floor. This new storage space is solid. A few throw pillows makes these pretty darn comfortable for lounging! We put some throw pillows on our new benches and now we’ve got not only a great place to keep our camera gear organized and a nice, new, clean look to our dining area, but we can kick back after a meal, prop our legs up on the benches and chit chat for a while. It’s fun to sit there together and get a new perspective on our little rolling home and on life! We never used to hang out after meals on our old chairs… but this is fun! The storage ottomans we bought are the Dover rectangular storage ottomans from Simpli Home Furnishings. We bought them from Amazon at this link HERE. These benches are ideal for us, but Amazon sells lots of other similar storage ottomans of different sizes and shapes too and you can find all kinds of storage benches for sale at Amazon at this link HERE). If you find the benches are a little low, one good way to raise them up is with the plastic rug protectors made for furniture legs. We also removed the feet from our table to bring it down a smidge. 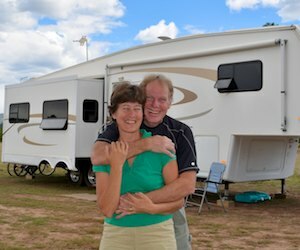 This entry was posted in The Full-time RVing & Cruising Lifestyles and tagged Full-time RV Lifestyle, New, Non-Travel, Other Tech Tips, RV Tech Tips, RV Tech Tips Trailer, Trailer Tech by Roads Less Traveled. Bookmark the permalink. What a terrific solution! Nice job! And so simple, Lisa. 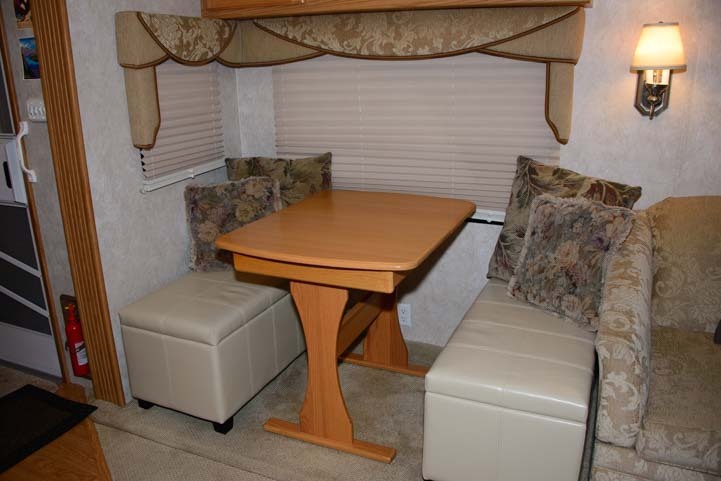 We considered having a custom “dinette” built, but this was much cheaper and easier! It’s a nifty little upgrade… and I LOVE and live in those slipper/socks, LOL!! Great idea! I’m filing this one away for future reference. Great idea! Now you have room for more, you can never have enough lenses. Wow very pretty! I love the look and functionality of it! Check out the furniture stores. Ours came with our rig. Great idea, do you know if it’s sturdy enough for a 250 lb man to sit on it? I love this idea, it’s so much better than the stand alone chairs that are always getting in the way. We have had a 300 lb. man sit on ours and it was okay, Pam. The cushioning is fairly thin and might flatten a little over time, but I think the boxes will hold up if he doesn’t plop down really hard when he sits. We LOVE this solution — we’ve had it a few years now — the added storage and clean look are great. Did you secure them to the floor? How one would go about it? I love this solution! They are not secured to the floor but we do have the four legs resting on carpet protectors. This gives them a little extra height and makes them less apt to slide. Have a look at our blog post on boondocking tips here. It talks a lot about water use and many other things. Hopefully you won’t lose your pensions, but I have no idea. Have fun in your Tropical and thanks for reading! We LOVE our storage ottomans, Eric. They aren’t expensive and they are extremely practical. We’ve had four for dinner at our table and they’ve worked just fine for that too!